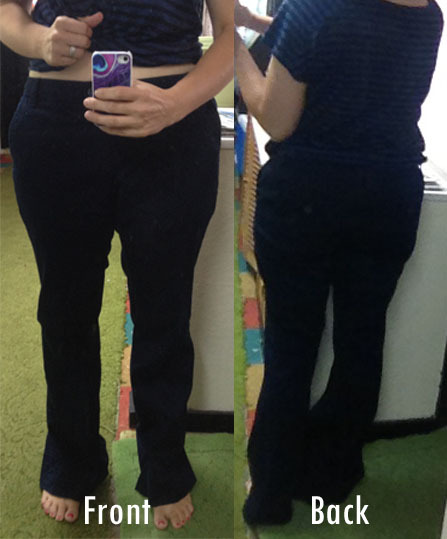 Fabricista Refashion: Wide Leg Pants to Skinny Pants! I don't know about you, but I have a lot of clothes in my closet that I want to wear, but they don't "suit" my needs. They may be too baggy in the crotch, too long, a bit too tight or I'm just not sure what to wear with it. I have had a pair of navy blue trousers for a couple of years that are hardly worn, but hated to give them away. So finally this past weekend I decided I was going to turn them into skinny pants! The pants were already too big so I had plenty to work with in case something didn't work out. These are the "before" pictures. The pictures are not that great, but you can see they are a little baggy and definitely too long. They were best worn with heels in their previous life. When doing this yourself, I would recommend picking pants that have some stretch to them. If you look at most ready-to-wear skinny jeans/pants, they have stretch so they move with you. See the following pictures and instructions on how to create your own skinny pants! 1) I put the pants on inside out. It is best to work this way so you can literally pin them on you. Pull on the seam till you feel comfortable. (Depending on how tight your pants are at the top already, you may not have to do this step.) On the right picture, you can see I took in about one inch on one side (I did this also on the other side.) I also took about 1/2 inch in at the crotch. I did not have to touch the zipper or waistband in this step. (Thankfully!) Another tip for this step would be to make sure both layers of fabric lay flat. 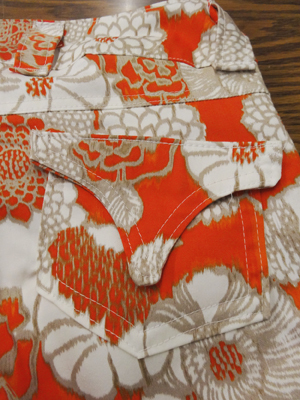 You don't want puckers or folds created when sewing. 2) Pin all the way down both legs to the desired width. Sew along the pins. Try them on to make sure they fit you the way you want. 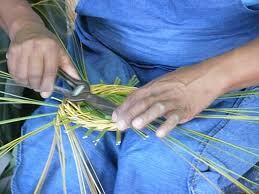 Then cut/serge off the excess. 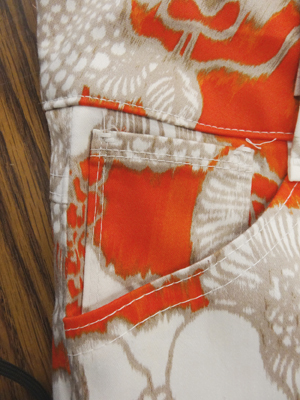 If you had to cut off the hem, sew a new hem. I made this ankle length, just like some skinny jeans I already have. It is as easy as that! Go dig through your closet and find some pants you're ready to change! It was a lot of fun and it cost $0!!! “Mujeres en Acción” es una propuesta a todas aquellas mujeres latinas con múltiples objetivos. Mujeres en Acción será en un principio un espacio de encuentro o simplemente artículos para la declaración de sentimientos Hispanos. Un escenario para expresar opiniones o simplemente pensamientos concernientes a mujeres procedentes de países latinoamericanos en Estados Unidos. En 1990 inicié mi trabajo con la organización alemana de cooperación técnica internacional, más conocida como GIZ, Deutsche Gesellschaft für Internationale Zusammenarbeit GmbH, GIZ. Esta reconocida organización del Gobierno Alemán posee oficinas en diferentes países en via de desarrollo, y promueve proyectos de cooperación internacional para apoyar el crecimiento de grupos o sociedades menos favorecidas. Uno de los proyectos en los que felizmente participé fue Equidad de Género, y cuando hablamos de Género en proyectos de equidad no nos referimos a la igualdad de mujeres y hombres pero sí a una igualdad de oportunidades para nuestro desarrollo. Sin embargo hay importantes consideraciones como el hecho de que las mujeres poseemos una marcada tendencia a la creatividad. En lo concerniente a la mujer latina se evidencia una capacidad para trabajar sin límites en producción de objetos, ideas, y/o procesos utilizando herramientas y elementos tanto naturales como industrialmente procesados, combinando el uso de antiguos procesos de productividad y modernas tecnologías. Para la mujer latina no hay paradigmas, sinembargo urge la necesidad de apoyo por parte de la sociedad (más mujeres) para poner nuestras creaciones al alcance del mundo para poner en manos de mujeres artistas elementos que faciliten la ejecució de sus ideas. Miles de latinas emprendedoras viven en Estados Unidos, trabajado por su cuenta muchas otras estan desaprovechando oportunidades por falta de información. Ellas representan un ejemplo de nuestra belleza y talentos!! En el año 2000 me trasladé a Londres, Reino Unido. Allí me ví obligada a cambiar mi carrera e iniciar un nuevo curso de acción para mi vida que se mantuvo estable hasta hace 3 años cuando felizmente me pude radicar en Estados Unicos, con nuevos proyectos pero igualmente productiva como toda latina!. En los lugares de trabajo y sitios en donde he vivido siempre he encontrado apoyo y confort en la hermandad latina. Hoy, deseo seguir aprendiendo de mis hermanas latinas. Promover la unidad y disfrutar de nuestra compañía. 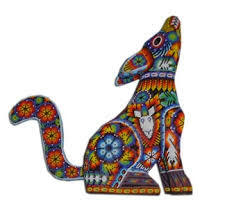 En éste espacio espero ponerme en contacto con mujeres que deseen cambiar su propio mundo en cuanto al placer de diseñar (moda, artículos decorativos, accesorios, etc) o por el solo deseo de crear, hacer arte, entretenerse o con propósitos empresariales. Un abrazo a mis hermanas Latinoamericanas y recuerden asi este nevando la alegria y disposición activa del vernano emana por nuestra piel. This blog post can be our own Women in Action space where Latin American women can meet to express their opinions and thoughts about Spanish women living in the USA. Let me tell you about myself. In 1990 I worked for the non-profit, international organization GIZ, known as Gessellschaft für die Internationale Zusammenarbet. This is a German Government-owned organization with offices in different countries that help groups of people in need. Gender Equality was one of the projects I most enjoyed. In the year 2000 I moved to London, UK. There I had to change my career and become stable in that work until I happily decided 3 years ago to move to the USA and settle down. Wherever I live and work, I always find a Latin American sisterhood to help and comfort me. I came to America feeling passionate about uniting and creating fellowship among other Latin American women. I have found that Latin American women use different kinds of resources, including natural and man-made resources to produce, transform and adapt old processes. For example, we do not pay much attention to fashion trends here. We often create our own styles. By doing this we need the support of other women to help and support us when designing and creating. There are thousands of Latin American women living in the USA that work by themselves and in result lose opportunities. I hope to get in contact with women that want to change their world becoming designers (fashion, accessories, etc), or just for the sake of making art a hobby or for commercial purposes. A big hug for all my Latin American sisters. Keep it in mind that even when it is snowing the summer happiness comes out through our skin! Well, this would be the end of small activities with LilG. 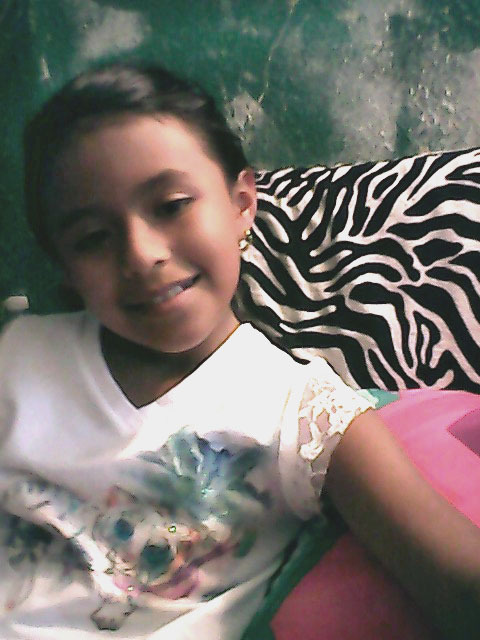 Soon she will be back to school, so we are getting ready for this coming school year. We already bought some new school clothes, however she wanted to personalize some of the pieces. 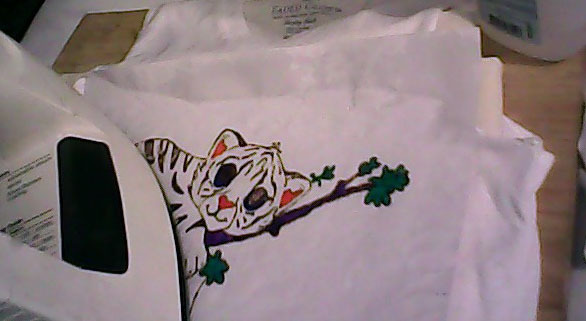 She used a white v-neck shirt to transfer a faded white tiger, her favorite animal, onto it. She is crazy about them! 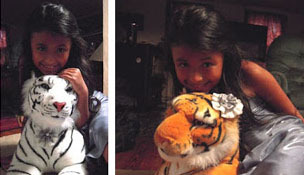 She searched the internet for white tiger images, she chose the one she liked most, which was a very difficult task considering she likes all of them. 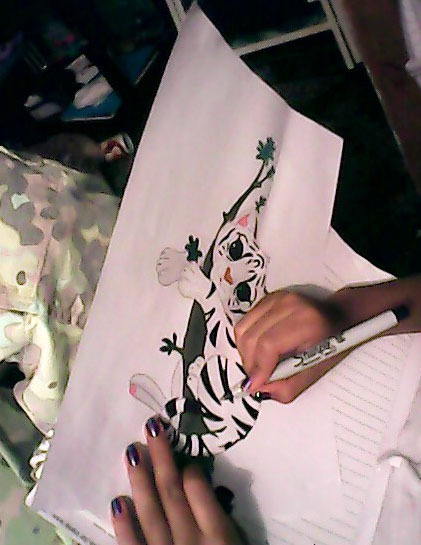 She printed the image on normal paper and traced it with sharpie colored markers. 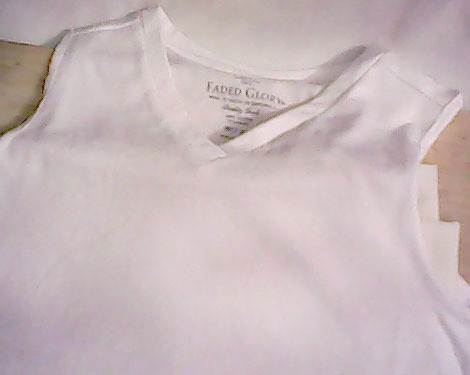 She cut the shirt’s sleeves and placed cloth in between the layers to prevent the image from being transferred to the back. She then placed the image upside down on the shirt’s face and sprayed it with rubbing alcohol. Carefully using the iron she pressed the paper with her design, spraying repeatedly and allowing time for the ink to be transferred onto the shirt and pressing again. 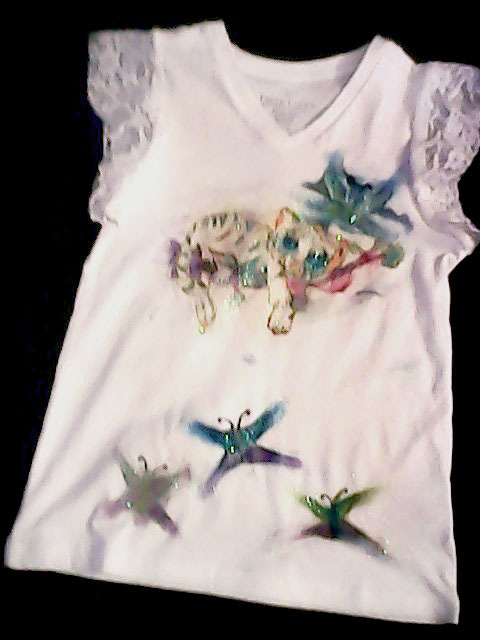 Once checking the image was transferred, she used glow in the dark paint and glitter to give it a sparkly neon finish. Her shirt, glows in the dark and looks amazing! 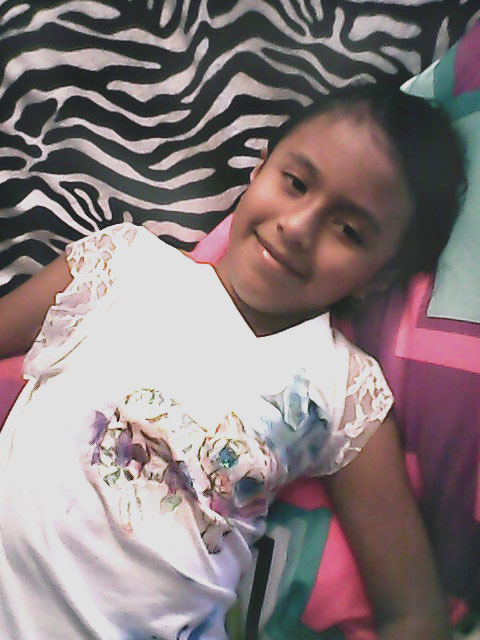 I sewed lace sleeves onto it and here it is, her own finished project. We will not forget this summer of fun projects!